With our 3 year guarantee, you will be enjoying your beautiful interior or exterior paint job, maintenance free, for years to come. Get the guaranteed service you deserve! We don’t spray, but instead paint the right way: with a brush and careful attention to detail. Deck work involves a three step process, and by following these steps we insure the lifelong enjoyment of your outdoor experience. Your local painting contractors since 1989! Fully insured, including workman's comp on all employees. 3-year guarantee on all labor. House painting takes time and energy that you may not have. Even if you do, but you'd rather be doing something else, don't keep putting it off. Trust the professional painters at Rightway Painting Solutions to do it for you. 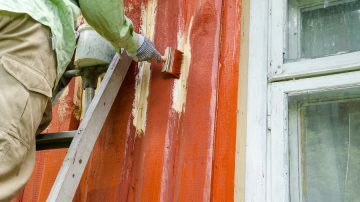 Painting the outside of your home or business can be dangerous if you are not properly equipped, or even if you have the help of another experienced painter. 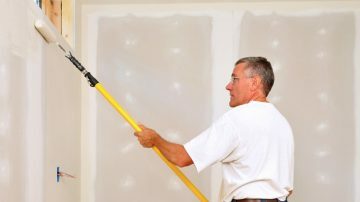 At Rightway Painting Solutions, our professional painters will tackle any job. 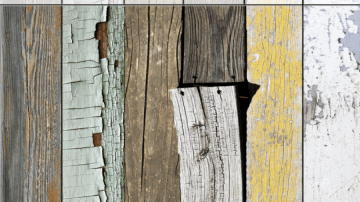 We follow three steps to give your deck a completely new look. It will look pristine and be a model for the neighborhood. Paul did a great job on our exterior paint job. He stained our house, deck, and shed. He pointed out options that others had not, and those things really made the difference. If we ever need professional painting done again we will call Right Way Painting Solutions. They got the job done quickly and were very professional. I had 3 quotes and they were the lowest cost. They did everything mentioned on the quote and didn't charge extra even though extra paint was needed or another coat applied. They seemed very interested in supporting us after the job was complete. They even offered a discount on seal coating our driveway through an additional business they operate. They did a great job & went above & beyond to make sure it was done to my satisfaction. The professional painters at Rightway Painting Solutions have decades of experience, and owner Paul Moore leads the way with over 20 years. Rightway has done work on both residential and commercial projects throughout the Minneapolis and St. Paul areas. Locally owned in Richfield, we’ve exceeded standards set fourth by our competitors since day one. "Professional Service at an Affordable Rate"